With 30 Minutes Or Less in theaters now, Aziz Ansari is enjoying quite the rock star lifestyle at the moment. In a short chat with Life + Times he briefly spoke on his role in the "Otis" video, which was probably the most random cameo we&apos;ve seen in a while. Check out what he had to say below. Life+Times: Your new movie is in theaters and you make a cameo appearance in a Jay-Z/Kanye video, are you having your best summer ever? Aziz Ansari: It’s been pretty good. I also had a really tasty donut for breakfast. Things are going my way. 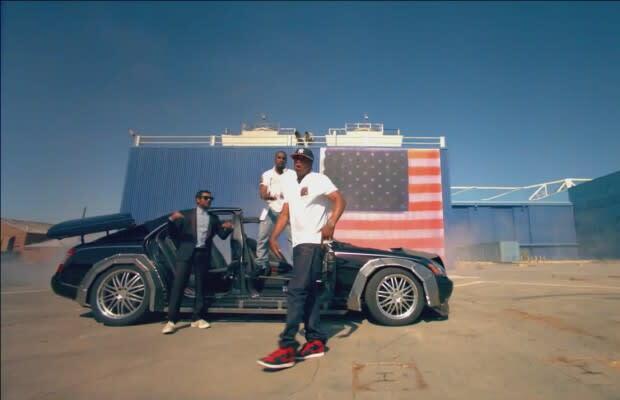 L+T: There’s a part in the “Otis” video where you seem to be pantomiming Ye’s lyrics as he stands on top of that Maybach, did Spike tell you to do that or were you just in the moment? AA: Spike just told me to be their hypeman and do whatever I felt like doing, so that was in the moment. L+T: Did you receive a custom Watch The Throne commemorative watch? AA: Nah, that was just for the producers. I got a Watch the Throne commemorative beer cozy made for myself though.